I planted out several Tristar Strawberries last year and they provided ample grazing throughout the season. I am looking forward to what they will offer this year! TriStar Strawberry – Everbearing – Tristar is a day-neutral strawberry variety that is excellent for both fresh eating and freezing. The berries are firm, red, very sweet, and solid with no hollow cores. They are conical in shape but only medium-sized. A big advantage is their production pattern. They begin producing with a bang early, will produce all summer long as long as conditions are tolerable, and will increase production again in the late summer to fall as they produce maximally at that time. Whether you buy them at the store or order them online, as soon as you get the strawberry plants to your garden, get them in the ground as quickly as possible. 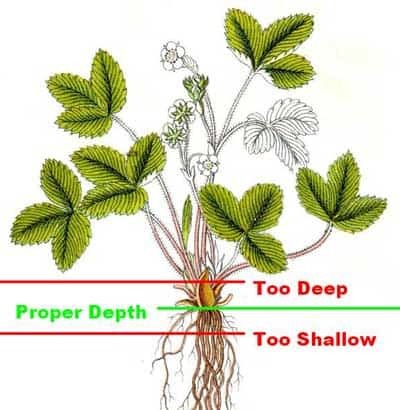 Strawberry plants have a thick section of tissue called the “crown” between the stems and roots. Your plants should be planted so that the crown is even with the soil. Plant them too high, and the roots dry out. Plant them too low or completely bury the crown under the soil, and your plants will be much more likely to suffer injury or disease. The time of year is a consideration in planting strawberries – most gardeners plant strawberries when the weather is warming up in the spring. Day neutral and everbearing strawberry plants don’t send out many runners and instead focus their energy on producing multiple harvests. The hill system is basically a raised bed 8 inches high and 2 feet wide. Plants are set out in staggered double rows, about 12 inches apart. All runners should be removed as well as all flowers until July 1st of the first year. Plants may then be allowed to produce fruit. Multiple harvests are exhausting on plants and both day neutral and everbearing varieties should be replaced about every 3 years or whenever they seem to slow in vigor. Mulch between plants after planting to keep the soil temperature cool, deter weeds and to keep the fruit off the soil. Straw is the traditional strawberry mulch. Do not use black plastic since it will raise the soil temperature and optimal fruit production requires cool soil. Asparagus is a medicinal food, having a beneficial effect on the kidneys, liver and bowels. Nutritionally, asparagus is rich in vitamins C & E, folate, potassium, and fiber. A well-tended asparagus patch can remain productive for over 15 years. Jersey Knight – This is a superior variety of Asparagus that produces premium quality spears up to 1″ (2 cm) thick – but despite being so thick they are tender and sweet. The cropping potential of this variety is enormous! And, up to 20 years cropping can be expected, this a highly profitable variety in every way for amateur and smallholder alike. 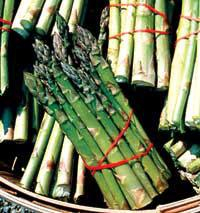 Sweet Purple – Larger and more tender option to green asparagus. Wonderfully mild, nutty flavor when cooked—20% higher sugar content than green varieties makes Sweet Purple delicious even raw! Spears turn green when cooked. How to Plant? Here is a good link that gives tips on planting your asparagus.